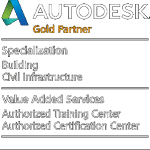 DIGITAL DRAFTING SYSTEMS (DDSCAD) is a Top Autodesk Authorized Gold Partner, Autodesk Training Center (ATC) and Autodesk Certification Center located in Miami and servicing all of South Florida. DDS works closely with Autodesk to provide the best solutions for your specific design challenges whether it is for the Construction, Building, Utilities, Infrastructure (Civil), and Visualization Industries. For over 30 years the company has been providing Autodesk Complete Solutions to Florida AEC professionals always striving to provide friendly and professional customer service. This has made us “Your CAD/BIM Business Partner” and Trusted Advisor.